A buildup of plaque and dysfunctional proteins in the brain are hallmarks of Alzheimer’s disease. While much Alzheimer’s research has focused on accumulation of the protein amyloid beta, researchers have begun to pay closer attention to another protein, tau, long associated with this disease but not studied as thoroughly, in part, because scientists only recently have developed effective ways to image tau. 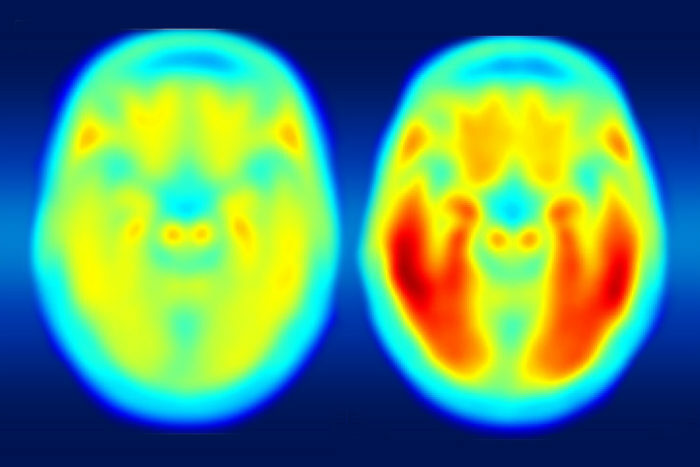 Using a new imaging agent that binds to tau protein and makes it visible in positron emission tomography (PET) scans, scientists at Washington University School of Medicine in St. Louis have shown that measures of tau are better markers of the cognitive decline characteristic of Alzheimer’s than measures of amyloid beta seen in PET scans. The new study is published May 11 in the journal Science Translational Medicine. Comparing brain images of people who are cognitively normal to patients with mild Alzheimer’s disease, the researchers found that measures of tau better predict symptoms of dementia than measures of amyloid beta. To determine degrees of cognitive impairment, some of the participants who underwent brain imaging also were assessed with the traditional clinical dementia rating (CDR) scale, cerebrospinal fluid measures, and widely used pen and paper tests of memory and other brain functions. The study included 36 control participants who were cognitively normal and 10 patients with mild Alzheimer’s disease. While Ances called for larger follow-up studies, he said this analysis helped establish that the new tau agent, called T807, is an important tool for understanding the timeline of Alzheimer’s progression and for defining which regions of the brain are involved. Beyond establishing a timeline, Ances said the new tool is vital to gathering spatial information about affected brain areas. Elevated tau measured in cerebrospinal fluid has long been a marker of dementia, but Ances said this type of data could not pinpoint which parts of the brain are gathering abnormal proteins. With imaging agents for amyloid beta and now tau available, Ances said researchers have the tools necessary to assess the effectiveness of investigational therapies against the buildup of both proteins. The new agent is approved for use in the context of clinical research trials and likely will prove to be important in imaging the brain for other types of disorders that also involve excess tau buildup, including traumatic brain injury. This study was funded by the National Institutes of Health (NIH), grant numbers P50AG05681, P01AG003991, P01AG026276, 5P30NS048056, 2UL1TR000448 and 5RO1AG04343404; the National Science Foundation (NSF), grant number DMS1300280; the Charles F. and Joanne Knight Alzheimer’s Research Initiative; the Hope Center for Neurological Disorders; the Fred Simmons and Olga Mohan Fund; and the Paula and Rodger Riney Fund. Avid Radiopharmaceuticals (a wholly owned subsidiary of Eli Lilly) provided florbetapir doses and partial financial support for the florbetapir scanning sessions. Avid Radiopharmaceuticals also provided the precursor for T807 and radiopharmaceutical AQ4 chemistry and technology for the Washington University Investigational New Drug, under which this study was performed. Brier MR, Gordon B, Friedrichsen K, McCarthy J, Stern A, Christensen J, Owen C, Aldea P, Su Y, Hassenstab J, Cairns NJ, Holtzman DM, Fagan AM, Morris JC, Benzinger TLS, Ances BM. 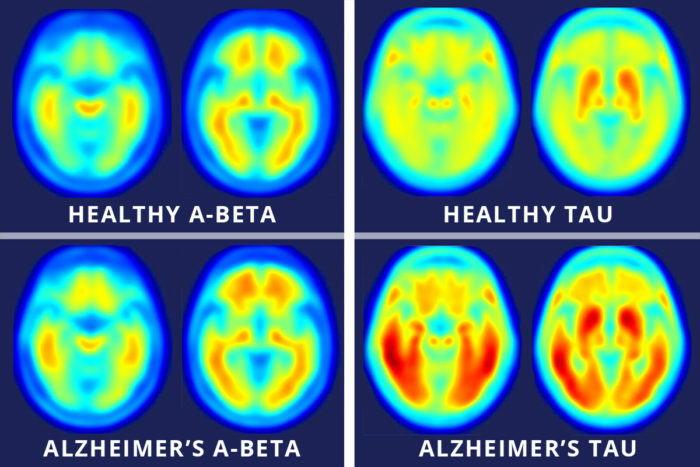 Tau and Ab imaging , CSF measures, and Cognition in Alzheimer’s disease. Science Translational Medicine. May 11, 2016.